Our guest blogger today is Rebecca Wall, who teaches Grade 1/2 students at Infusion Champion School St. Joseph's School in Chemainus, BC. The students visit the garden often where they can observe the local wildlife, dig in the garden, and sketch items from the natural environment. Ms. Wall shares the steps that went into establishing the class garden and samples of the students' drawings when they pulled up daffodil bulbs. Read Rebecca's first post about this project. One of the benefits of being an Infusion Cohort classroom is the opportunity our class has to work with an Infusion Artist, Ewa Sniatycka. Her wealth of experience with arts in education and creative ideas help us to explore the topics we are studying in many different ways. Throughout the year she has worked with our class to develop our art skills while building a classroom garden area. The garden area has become a part of our classroom community and we have enjoyed all of the arts integrated activities that we have completed here. 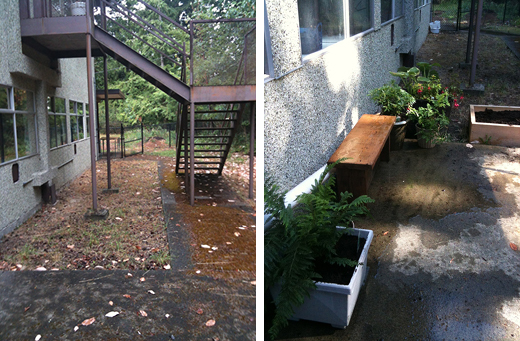 During the end of August, in anticipation of a garden project, we selected an area directly behind our classroom that was in much need of care and attention. The first step would be to spend two days power-washing the pavement and clearing the debris from the walkways and surrounding area. With help from many generous volunteers who raked the area and built garden boxes, the garden area was ready for Grade 1/2 students before the beginning of the school year. Hoping that this would be an area where students could observe the wonderful wildlife and plants, a bench was built for students to sit. This quickly became a favorite place for students to place their sketch journals while they recorded their thinking or to read a book in the early Fall. 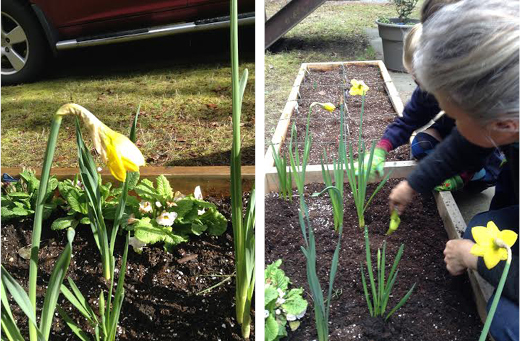 At the beginning of October, students planted tullip and daffodil bulbs in raised garden beds. Then we waited patiently throughout the winter months for our bulbs to grow. Each day, students looked out the window hoping that they would spot some sign that the plants were growing. Some students took out books about plants from the library. I quickly realized that two raised garden beds were not enough for this enthusiastic group of young gardeners. As the first daffodils started to bloom, a student in the classroom started asking if we could plant vegetables in our garden. I knew that our 2' x 6' garden beds would not provide the space needed for growing lettuce, peas, carros or strawberries. A colleague suggested that I investigate square-foot gardenning with children. What I read sounded perfect for our arts integrated Science unit on the garden. Each student in the class was assigned a square foot plot of soil where he or she sowed seedlings and bulbs of his or her choice. Students measured, recorded and sketched their observations of their plot in a sketch journal. We took another two days to build the square-foot garden area and clean the garden for spring. Once our square-foot garden plots were established, we invited Ewa to join us in the garden. 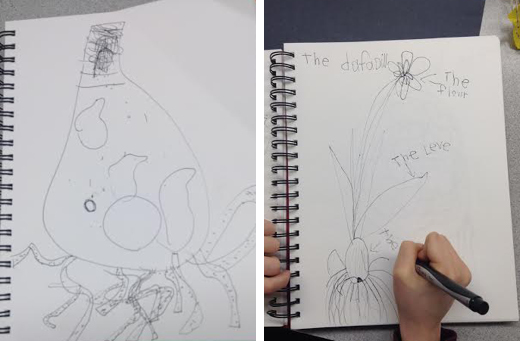 While she visited, Ewa guided us through a process where students "dug up" the daffodil bulbs they had planted in the fall and recorded what they observed in their sketch journals. 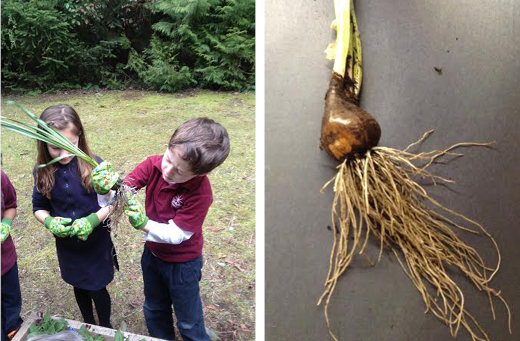 Many students were quite surprised about the length and thickness of the daffodil bulb roots. As they uprooted them, the students tried to count the number of roots on each plant. As they were brought back to the classroom, each table group examined a different daffodil bulb, its roots, the stem, and flower. Many students noticed that the bulb had expanded significantly since we planted it in the autumn. Many students were also careful to include the intricate details they noticed when observing their bulb. This student recognized that parts of the bulb skin had pulled away with the moisture. 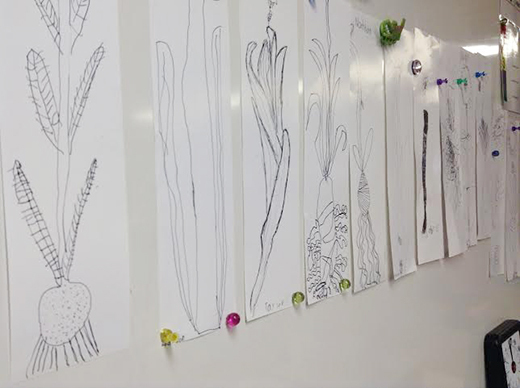 Some students decided to add labels to parts of their daffodil bulb sketches. They were very proud of their ability to label each section. Once students had practiced in their sketch journals, they used a section of long poster paper to sketch a larger section of the plant. These mini-posters are now on display in the classroom. Read more guest blogs about Arts Integration in Action!